Despite struggling early, Seward came alive late in a 69-57 grinding win over the Gillette, Wyoming Pronghorns in the Pizza Hut Classic Friday in the Green House. 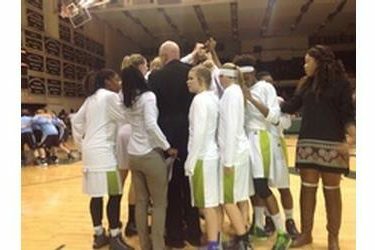 The teams were tied 27-27 at the half and Seward led by one 43-42 at the end of three. The eighth ranked Lady Saints out scored Gillette 26-15 in the fourth quarter. Seward forced 33 Gillette turnovers and led points off turnovers 29-12. Axelle Bernard scored 17 with 14 rebounds while Daniela Galindo dropped in 16 and Tiani White had 15. Seward is 3-0 and plays Unversity of the Southwest JV Saturday night at 6 on B107.5 and kscbnews.net. Garden City beat them 87-31 Friday afternoon.